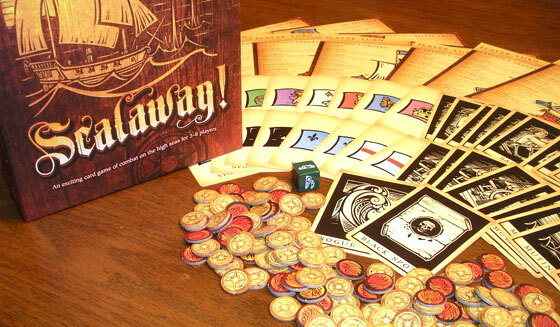 BoardGaming.com> Games> Card Games> Scalawag! May the best (bluffing) captain win in this last-captain-standing nautical battle! In Scalawag! each player takes the role of a captain and battles it out on the high seas (your table!) against the other players with the goal of being the last ship floating. Along with their ship, players will have crew cards that are kept secret from other players. Different crew members allow you to take special actions or gain extra bonuses on your turn. The twist with Scalawag! is that you can bluff and take an action with a crew member you don’t actually have. Other players have a chance to challenge your actions by calling “Scalawag!” If you’re bluffing you’ll suffer the consequences, but if you weren’t bluffing, the challenger will have to suffer those consequences instead! You can even form verbal alliances during the game, but when it comes down to it those only last so long because it’s every captain for themselves. Each player starts off with a ship mat, two compass points and three crew members. The ship cards are much more than just a way to keep track of your ship damage. They also lay out all the actions (called Captain’s Orders) you can take, the crew members you need to perform certain actions, the bonuses that crew members offer to those actions and the prizes you get for defeating other players. Before going into the gameplay details, it’s important to know about the two ways your ship can get eliminated. Ship Damage: After receiving 5 damage your ship is sunk! No Crew: If you lose your 3 crew members, your out! On a player’s turn they will do two things. First, they’ll issue one Captain’s Order. Then, they’ll gain two compass points. That’s it, very simple! Captain’s Orders involve gaining compass points, stealing compass points, spending compass points to deal damage to other ships or to make them lose a crew member, making other players change their crew members, or making yourself better protected from damage for a round. The player being challenged must either reveal the crew cards they declared they had, or take the penalty. If they reveal that they do in fact have the crew they declared, it’s the challenger who takes the penalty. Whoever loses the challenge chooses to either take a ship damage or lose a crew member. This means you don’t want to challenge too often because you could get knocked out of the round by simply calling bluffs that weren’t actually bluffs! Note that when you reveal your cards, after the challenge is over you shuffle the revealed cards in with the extra crew cards in the center of the table and draw the same amount back out. This way the other players won’t know what cards you have. The reason deduction is possible is because there are six different crew members, and only a certain number of those are included in the deck that is dealt out to the players in the game. For example, in a game of four players you’ll have four sailors, gunners and marines, and two pilots, mutineers and lookouts (a total of 18 cards). Each player is dealt three so there will only be six left un-dealt. So if you’re dealt three sailors and another player takes the “Trim Sails” action and declares they have two or three sailors, you’ll know they’re bluffing because there are only four in the deck! Also, when crew members are eliminated they are discarded face up in the center of the table (Davy Jones’ Locker) for everyone to see. When you defeat another player you get a prize depending on how you did them in. If you sunk their ship with damage, you gain a random crew card from them (but must discard down to three). If you defeated them by making them lose their last crew member, you get to remove damage from your ship! Attacking other players at the right time can be key so that you get the prizes and your opponents don’t! The last captain floating is the winner of the round! You can play as many rounds as your group wishes. Yes, if your family gets along and enjoys games where you’re constantly attacking each other. No, if you or your family doesn’t enjoy “all against all” games or bluffing games. Scalawag! is great with a group of players. The more you play it, the quicker the game rounds go, and there’s plenty of player interaction even when it’s not your turn. While there is plenty of strategy in Scalawag!, the Strategy Gamer purest probably won’t feel they are in as much control of what’s going on as they would like to be. This is definitely a “lighter” game that you could bring out with pretty much any group and have a good time. Sometimes it’s nice to take a break from those rule heavy and time consuming games. If you thrive on competition and/or games with deep rules and complex strategies, this is not one of those. But if you’ve got a group and want to play something quick and fun, this is definitely worth a look. Scalawag! is full of wonderful woodcut artwork that fits perfectly with the theme, and the components are top notch. It also scales very well between 3-8 players. All games give you that range of number of players, but you can sometimes find that they are “broken” when played with too few or too many. With Scalawag! you can tell the designer play tested the game thoroughly and went the extra mile to balance the game when played with three players by including special rules and a custom die to keep things balanced. As an added bonus, there are also rule variants where you can play with secret allegiances. If you have a limited edition copy you also have the option to play with bonus crew cards that change up the gameplay. This adds even more replayability to the game. You definitely get a bit of a rush when playing the game. Should you bluff to get those extra bonuses, and if you do will someone call you out? You THINK the other player is bluffing, but if you challenge and you’re wrong you’ll have to take the penalty! If you’ve played games with bluffing or a traitor mechanic you’ve probably experienced it first hand (ie: The Resistance, Coup, Shadows over Camelot). Scalawag! has a lot to offer, and is a welcome addition to group games. If you enjoy bluffing, deduction and games with a nautical theme you should definitely check out this game. Cannon smoke drifts heavily across your bow, obscuring your view of the battle strewn across the seascape. Several ships are locked in a fight for naval supremacy. Sailors climb the rigging as you command your pilot to steer windward, taking the weather gage on the closest ship- gaining superior position. As your gunners open fire with cannon, you call out to your marines to prepare for boarding! Scalawag! is a competitive card game for 3-8 players. Each player is the captain of their own warship with the goal of eliminating all other players (or teams during Allegiance Play). Game play consists of a player issuing one Captain’s Order each turn, generally allowing them to either gather additional Compass Points (the game currency) or spend Compass Points to attack their opponents. Players support their Captain’s Orders by declaring Crew. As a player’s Crew Cards are kept hidden from others and bluffing is allowed, knowing when to bluff and when to call a bluff (by declaring Scalawag!) is an important element to successful play. Steve Nix gives an overview of the gameplay and components of Scalawag! Add a Review for "Scalawag!"